The equestrian team rides at Avon Valley Show Stables and also travels around the state and country for competitions. Ski Sundown is home to the Porter's ski team. home to Varsity Field Hockey in the fall, and Ultimate in the spring. The Cowbarn Field is a NFHS regulation softball field complete with a skinned infield that is home to the Varsity Softball team in the spring. Kiki's Field is a full NCAA regulation synthetic turf field that is home to Varsity Soccer in the fall season and Varsity Lacrosse in the spring. Maple Field is a full NFHS regulation synthetic turf field that home to JV and Thirds Soccer in the fall season and JV Lacrosse in the spring. 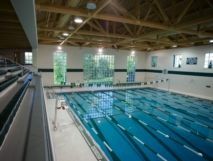 Varsity Swimming and Diving uses the eight-lane, 25-yard pool in the winter season as do fall and spring swimming and lifeguarding classes, and recreational swimmers during open swim times. Eight international squash courts serve as home to our Varsity, JV, and Thirds Squash teams in the winter season. Home to the Volleyball teams in the fall season, our Basketball teams in the winter season and in the spring, the Crisp Gymnasium is the designated indoor space for spring preseason. The suspended two-lane indoor track is located above the Crisp Gymnasium. stepmills, recumbent Lifecycles, and ergs (rowing machines), Lifefitness strength training machines and free weights. Home to Varsity Badminton in the fall season and our Basketball teams in the winter season. In the spring preseason, the Mellon Gymnasium is the designated indoor practice space for Varsity and JV Softball. The Dance Barn is the home of the Dance Workshop and all dance classes. Seven deco-turf courts are home to our Varsity and JV Tennis Teams in the spring season. In the fall, the courts are used by our instructional tennis sport classes. The Varsity and JV Crew teams practice on the nearby Farmington River, using a new boathouse and dock. The beautiful wood structure, shared with the crew team ofFarmington High School in a unique public-private relationship, is the home of the Porter's Varsity and Junior Varsity Crew teams. 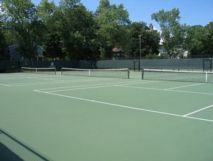 The program is equipped with six Vespoli fours, a pair/double and three recreational singles. The weight room is used by all students. It is equipped with benches, squat racks, plyometric balls, free weights and a multistation weight machine. The erg room is equipped with twelve Concept2 ergs. The room is used by the crew team for off-season conditioning and by students participating in winter sports classes. The climbing facilities include a vertical wall with two features and four belay stations, a horizontal wall traverse and an overhanging boulder. The climbing wall is used for sports classes throughout the year.